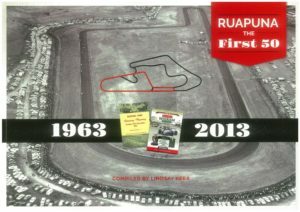 Just released, “Ruapuna the first 50”, is a scrapbook style publication, compiled by the Star’s motor racing writer from the 1980’s and 90’s, Lindsay Kerr. The book traces the origins of the local track at Templeton back to its inception in 1963. It is divided into nine chapters that involve, the beginnings, through the five decades, the success of classic car racing and chats with some of the drivers who have helped carve Ruapuna into the internationally accepted venue that it is today. Over 150 photos from the five decades have been reproduced along with a collection of programme covers, magazine items, newspaper cuttings, event advertising and written material from the Canterbury Car Club’s own bulletin. Drivers spoken to, include some well-known Canterbury motor racing names, including Trevor Crowe, Avon Hyde, John Crawford, Maurie Bone, Grant Milligan and the late John Osborne. In addition there is a chat with Barry and Nola Brown. Now in their 80’s, the Browns were involved with the volunteer force that built the track and also raced on it. The book is available from the Canterbury Car Club office on 03-349-6003. The retail price is $50 plus package and postage.